MRAM (Magnetic RAM) is a memory technology that uses electron spin to store information (an MRAM device is a Spintronics device). MRAM has the potential to become a universal memory - able to combine the densities of storage memory with the speed of SRAM, all the while being non-volatile and power efficient. The road towards such a high-end MRAM device is still long - but MRAM chips are already on the market, and the technology advances and is being researched by dozens of companies and many universities and research institutes around the world. MRAM can resist high radiation, can operate in extreme temperature conditions, and can be tamper resistant. This makes MRAM very suited for military and space applications. The first MRAM devices to be realized used toggle memory switching, in which a magnetic field is used to change the electron spin. Toggle MRAM was easier to develop, but it is very hard to scale down. Second-gen MRAM devices use a spin-polarized current to switch the spin of electrons. So-called STT-MRAM devices are faster, more efficient and easier to scale-down compared to toggle MRAM. STT-MRAM chips are now beginning to be introduced to the market. MRAM chips on the market? In July 2006, Freescale started to sell the world's first commercial MRAM chip. Those chips had a low capacity of 4Mbit and the price was set at $25. 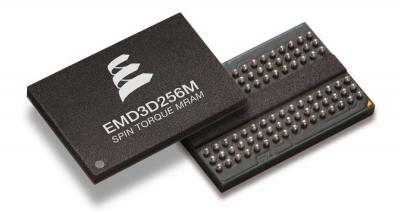 Freescale's MRAM division was spun-off into a new company called Everspin which since then shipped chips up to 256Mbit in size. Everspin is now shipping both Toggle-MRAM and STT-MRAM chips, and is working towards 1Gb chips (hopefully by the end of 2016). Everspin is currently the only company that mass produces MRAM chips, and the US-based company shipped over 60 million MRAM chips. Many companies are also developing MRAM chips, including IBM and Samsung, Toshiba, Everspin, Avalanche Technologies, Spin Transfer Technologies and Crocus.